Baking soda, or sodium bicarbonate, has been known for centuries as a versatile substance with many different uses (and you can refer to my previous article about 7 uses for baking soda as a kitchen medicine, as well as my article about the healing power combination of lemon and baking soda). As the name suggests, it’s most famous for its role in baking and cooking. But there are numerous medicinal properties attributed to drinking baking soda mixed with water and I’ll describe one of them in this article. Baking soda can be found in nature as a part of the mineral Natron, which contains large amounts of sodium bicarbonate. This mineral was used already in ancient times as a cleaning substance. Baking soda, as we know it today, has been manufactured since 1846 and its popularity soon reached iconic status. Almost every home features a box of sodium bicarbonate. Cheap, safe and simple to use, it became a part of the solution for many ailments and troubles. In 1924, Dr. Volney S. Cheney published a book called Arm & Hammer Baking Soda Medical Uses, in which he recorded his experience with treating flu. He observed that people who were treated with baking soda either remained healthy or they developed a milder version of the disease. Dr. Cheney reported giving generous doses of sodium bicarbonate for influenza and in many cases the symptoms disappeared within 36 hours. He also suggested taking baking soda as a preventive measure. The general belief is that when taken internally, baking soda helps to maintain the pH balance in your bloodstream. The substance has an alkalizing effect on the body, which is linked to better health and disease prevention. Although it has many supporters, this theory has not been scientifically proven. Day 1: take ½ teaspoon of baking soda diluted in a glass of cold water, six times a day, at about two-hour intervals. Day 2: take ½ teaspoon of baking soda diluted in a glass of cold water, four times a day. Day 3: take ½ teaspoon of baking soda diluted in a glass of cold water in the morning and in the evening. After this initial period, take ½ teaspoon of baking soda diluted in a glass of cold water every morning until your symptoms are gone. Horseradish (Cochlearia armoracia) is a medicinal plant and is particularly potent in the treatment of sinusitis and it clears upper respiratory passages, which helps with cold, flu and lung congestion. Horseradish works as a mild natural antibiotic. It helps your body get rid of the mucus, and it is recommended to take horseradish as soon as you start feeling the cold or sinus infection setting in. You can read about research on horseradish, how to take it, and horseradish recipes to clear your nose and chest in my article on How To Use Horseradish For Sinus Infections, UTI, Cold, Flu And Bronchitis. These other natural cold remedies are courtesy of Amy Goodrich, yogi, health coach, and dedicated blogger who loves living a natural, eco-friendly, and healthy lifestyle. Fever, sore throat, cough, aches, fatigue… common symptoms of the flu or a cold. Even the healthiest person gets sick once in a while. Especially during winter, as temperature drops, we spend less time in the sun, vitamin D levels drop, and we are more likely to spread viruses from one person to another due to a weakened immune system. Many people believe that colds or the flu are caused by bacteria, and many doctors will prescribe antibiotics to treat the symptoms. But actually, most colds and flu are caused by viruses. So, in most cases, taking antibiotics makes no sense at all. Actually all those symptoms are part of your body’s natural healing process. Your immune system is going in overdrive to kill those intruders. A fever, for instance, is your body’s response to try to kill those germs by creating a hotter environment than normal. Just as diarrhea is your body’s response to flush out all those germs. So basically, your body has to do most of the work to get rid of those and sickness is actually a sign that your body is handling it all by itself. If you are having a fever or diarrhea, you are losing a lot of your body fluids. Drink enough water or herbal teas to make sure your body stays hydrated and gets plenty of healing sleep while your body is fighting those germs. Hot liquids, such as herbal teas or lemon water, will boost your immune system and many herbs can help your body to get rid of the infection. Avoid caffeinated and fizzy drinks. Find here the benefits of drinking lemon water and how to make cleansing ginger lemon tea. Garlic is well-known for its flu and cold fighting properties. It works as an antibacterial, antifungal, and antiviral agent. You could make a healing garlic soup or mince 1-2 cloves and add those to a small glass of water. When pregnant limit the intake to 1 clove of garlic day. Find here how to make garlic syrup for chest infections. Consuming more garlic is also one of the 70 habits featured in the e-book 70 Powerful Habits For A Great Health which will guide you how to take positive steps to improve your wellness and overall health. There are many healing herbs for you to choose from. Herbs that work well to treat the flu or cold are: nettle leaf, peppermint, ginger, yarrow, elderberry, chamomile, red clover, and catnip. Find here how to make red clover tea to relieve cough and bronchitis and healing calendula tea to relieve sore throat. Also increase the intakeof echinacea – this is the best-researched herb for enhancing immune defense. You can find here more natural substances to boost your immune system, as well as how to make echinacea tea. Not only adds a great taste to your herbal teas, but has strong antibacterial and antiviral properties. Especially when combined with honey. Works wonders to soothe a sore throat, lower fever, and relieve cough and congestion. Find more about the amazing health benefits of cinnamon in my article how to use cinnamon as a medicine. Epsom salts help your body to detox, they improve circulation, strengthen your immune system, and reduce inflammation. You can find here the most extraordinary uses for Epsom salt. Elderberries and echinacea are well-known to treat the flu or cold. They strengthen your immune system and help your body to get rid of viruses and bacteria. Check out my previous post and learn how to make healing elderberry cough syrup. You can find here another easy and effective syrup to relieve sore throat and cough. Effective to treat an upper respiratory or ear infection. Put a few drops of 3% hydrogen peroxide into each ear. Wait for about 5 to 10 minutes, until the bubbling is done, drain on a tissue. This may sting a bit. Do this while lying down and one ear at a time. You can find here more fantastic uses for hydrogen peroxide. Vitamin D helps to speed up the healing process, zinc prevents viruses from reproducing, and vitamin C strengthens your immune system. Lemons are a great source of Vitamin C. Find here more information on how to boost your immune system. Not the nicest taste but very effective to alkalize your body and get rid of viruses and bacteria. Add one tablespoon to a cup of water, gargle first and drink when the first signs of illness appear. Repeat every hour until symptoms disappear. Add freshly squeezed lemon juice for a better effect. But keep in mind, don’t use this remedy too long as it may cause low potassium levels and may lower bone density when used over a longer period. You can find here 10 uses for apple cider vinegar for great health and at home. Herbal steams are a great way to help loosen congestions and kill bacteria and viruses in the lungs, throat, bronchials, and sinuses. You can use essential oils or fresh or dried herbs to make your herbal steam. Thyme, eucalyptus, peppermint, rosemary, oregano or blends of those are all good options for you to try. Boil 1-2 cups of water and add your herbs or essential oils. When using herbs, cover and steep for 5 minutes prior to steaming. Put face directly over pot with towel covering your head to hold in the heat. Slowly breathe the steam in and out for as long as you can, aim for 15 minutes. Find here more information about the best home remedies for sinus infection. And don’t forget the best remedy to fight the flu or cold is rest. Give your body the time to heal itself. Do you have more uses of baking soda for other purposes like for household items? But the internet is full of information about household uses for baking soda. I read on another site that we should find baking soda without aluminum if taking internally. Is this true and where would we find that?? Thank you so much. Baking soda is 100% sodium bicarbonate with no aluminum. I think you are confused with baking POWDER which is a different product. Not all baking POWDERS contain aluminum – it depends on the manufacturer. (they are usually labelled as “aluminum-free”). I think its usually called bicarbonate of soda. Baking soda is the same thing usually. You get baking powder, which contains bicarb, tried to use it once and felt sick, it also contains cornflour or starch and other things and isn’t really ideal…. since it also contains the acidic agent too!! will just make you sick and have none of the effects! You can use interchangeably in cooking 99% of the time, but never in medicine. Because the names are pretty confusing tbh, i wish people just called it bicarbonate of soda. I am beginning the Dr. Cheney dosing instructions for curing a cold. I have to begin by taking 1/2 tsp BS every 2 hours in a glass of water. How long do I need to wait before I can eat, once I have taken a BS dose? If you don’t take any medication, then there is no risk of interaction with baking soda and you are not limited regarding the time you can eat. However if you take medication, some of them may interact with baking soda and then you need to follow the instructions on the medication leaflet (or your doctor’s instructions). Bicarb soda was prescribed to me when I had candida. I took half a teaspoon three times a day for 2 weeks. The candida disappeared super fast but one of my teeth became super sensitive and part of the enamel disappeared. I read that when you take bicarbonate soda the body takes minerals from the bones to re-balance the pH of the body. I would like to keep on taking bicarb soda but am worried that it might affect my teeth again. I was wondering if you might be able to give me any advice. Hi Fleur, drinking baking soda water is good for many things, which you can read about in my article “The Most Amazing Health Benefits of Baking Soda Water“. 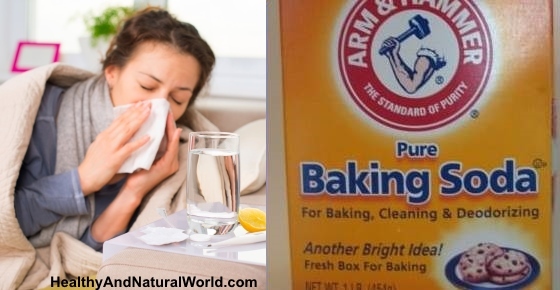 You can find at the end of the article precautions, and one of them is that many of the remedies that can be alleviated with baking soda water are for temporary relief of the various conditions, and the usual recommendation is to avoid taking baking soda water regularly for more than two weeks. Other precautions include interaction with some medication, as well as people who suffer from high blood pressure and edema. I wouldn’t make drinking baking soda water a daily habit and wouldn’t excess 1/2 tsp. per day if you don’t suffer from any condition. Too much of anything is not good for the body, so you need to make sure you don’t overdo it. In what ways can baking soda mixed with lemon help your physical well being. This is for a school project so any knowledge would be greatly appreciated. Please refer to this article for more information.